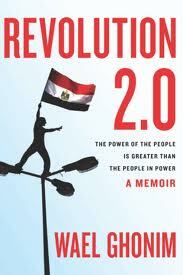 Wael Ghonim’s Revolution 2.0: The Power of the People is Greater than the People in Power has been selected as this year’s Summer Reading. The Summer Reading is a part of the College’s annual series of intellectual and cultural programs designed to engage our community in discussion around a selected theme. The theme for this year is “Freedom and Tyranny.” As part of Welcome Week, you and your peers will have an opportunity to examine Ghonim’s book in a discussion led by a faculty/staff facilitator on August 27, 2012. You will receive complete Summer Reading instructions at the time of Summer Orientation in July. They will also be posted at this site. This year’s Summer Reading is Wael Ghonim’s Revolution 2.0, published in 2012 about the uprisings in Egypt during 2012 and the role of social media in making that happen. With the theme of “Freedom and Tyranny” in mind, please be prepared to share your responses to Revolution 2.0 with your fellow students and faculty/staff facilitator in your Summer Reading discussion group August 27. The quotation from Ghonim suggests that social media provided an opportunity for him to direct his anger toward injustice in a way that could mobilize people to action rapidly. After reading this book, and reading about recent elections in Egypt, what difference do you believe social media made in the outcome of the Egyptian revolution? Did social media have a lasting effect? Ghonim’s comment also suggests powerful things about the effects of class on the consumption of information through social media. He suggests that Khaled’s death was more disturbing to Egyptians because he was middle-class. In your experience does a person’s social class position have a similar effect in the United States? Consider the effects of social media on your own social or political awareness. In what ways has your own understanding of your community or your world been influenced by your consumption of and participation in social media? To what extent do social media filter your experience of the world (the way that you receive news and information about current events—either private or public)? Can you compare it to the situation in the book where Egyptians had few outlets for information that was not state-mediated? You might discuss your use of social media with your parents or other community members to gain an awareness of how social media has changed the notion of community. How would you assess conditions for ‘freedom’ in Egypt a year and a half after the successful ousting of Egyptian President Hosni Mubarak? What are the implications of the dissolution of parliament by the Egyptian ‘high court’ and the continued dominance of the army in ‘governmental’ matters? Does the election of a member of the Muslim Brotherhood as president complicate matters? Explain how these events sustain, move forward, or impede the cause of freedom in Egypt. You must use your official TCNJ email account and you should send it as soon as possible, but no later than August 20th. Please also bring a hard copy to your discussion session on August 27. Please note: We will be using the Houghton Mifflin Harcourt hardcover edition of Revolution 2.0. It will be available at the College Bookstore, but you are free to purchase it anywhere—ISBN 978-0-547-77398-8. You may also read it in an electronic version or, if it is available, in a paperback edition, of course. The Cultural and Intellectual Community Planning Council, a college committee made up of faculty, staff, and students chose the book. It is an engaging book that addresses both this year’s Intellectual theme of “Freedom and Tyranny” and the emerging role of social media in shaping societal change. Although completing a satisfactory essay is a requirement of the summer reading program, you will not receive a grade on it and it will not appear on your college transcript. Students whose essays are found unsatisfactory may be required to do additional work or participate in next year’s summer reading program. Your essays will be forwarded to the facilitators for the discussion groups for the Summer Reading Program and you might receive written feedback on your writing. Many of these facilitators will also be First Seminar instructors. While your essay will be retained for potential assessment efforts on campus, you aren’t writing the essay for the purposes of an ‘assignment’ in the traditional sense. You will discover in your first year of college that people learn best when they use all their intellectual faculties—reading, writing, speaking. The purpose of the essay is to give you an opportunity to think critically about the book and to prepare you to speak confidently about it in your discussion session and with your peers prior to the discussion.